Start your day off right with a layered tropical fruit smoothie. This smoothie is not only beautiful, but it is packed with protein, vitamins, and antioxidants to help you stay energized and satisfied. Cut out star shapes from pineapples slices & watermelon- set aside. In the blender, blend Odwalla Strawberry Protein Drink, 1/3 cup ZICO, strawberries, vanilla yogurt, and Ice Cubes. Pour mixture into two large cups. Wash blender, and then add the ZICO, pineapple, cantaloupe to the blender, and blend until smooth. Pour over the top of the strawberry. 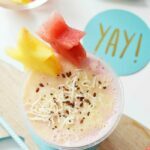 Garnish with chia, coconut flakes, and a straw! Enjoy!